Small creatures seen in the South Loch Ness area of the Highlands of Scotland. 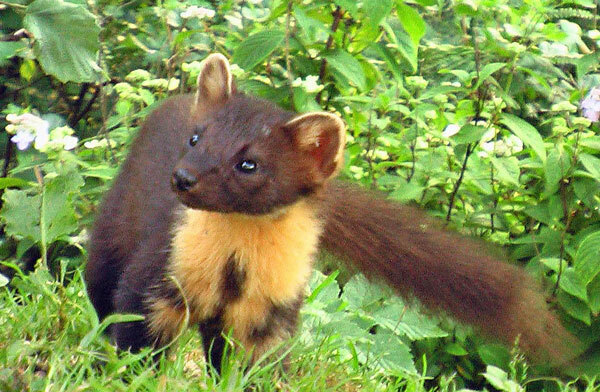 In the dusk you may be lucky enough to catch a glimpse of the elusive Pine Marten which is about the size of a sleek cat and have been seen near Camerons Cottage and the nearby village of Foyers usually between dusk and nightfall running across the roads. They are easily identifiable by the dark brown fur that contrasts nicely with the creamy light apricot chest area. 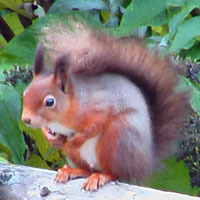 They eat berries, small mammals and insects and are now partial to the peanuts. They are also very agile climbers and one of the only predators that can catch red squirrels by darting through the trees as it chases them. 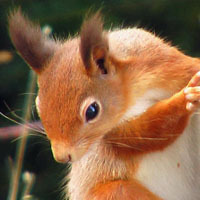 Red squirrels are abundant in the surrounding coniferous woodland of Foyers and Farigaig Forest as their favourite natural foods are pine cones and hazel nuts. They can often be seen scampering along the tree branches in the forest. 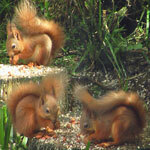 Their long bushy tail is used for balance and they have amazing ear tufts at certain times of the year. Also very sharp little claws to assist with climbing and feeding. The young are called kittens and are born in Spring although a second litter can be born in Summer if conditions are right and food is plentiful. We have seen a squirrel carrying its young in its mouth several times in the Spring/Summer months. The young are great fun to watch and often appear together to eat and have fun chasing each other along the branches and up and around the nearby trees. Badgers are in the nearby vicinity and they live in a very large badger sett - a system of underground burrows - in the surrounding forest and they have been seen and heard rushing through the undergrowth at nightfall. They are strangely partial to peanuts. A fully grown badger is about 1 metre long with long, course, greyish hair on the back and a white face with a broad black stripe along each side. They have crushing molar teeth adapted to a partly vegetable diet and short strong legs with long sharp claws suitable for digging up their favourite food - earthworms - strange choice for such a large animal. They also dig for roots, mice, insects and a variety of fruit and nuts. 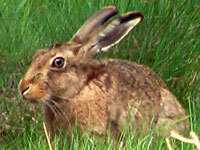 Brown Hares are often seen in the early morning or at dusk running along the narrow lanes before darting suddenly into a nearby field. They have brown fur and white underparts and long black tipped ears which are very useful for hearing predators. Luckily they can run extremely fast. Although foxes are mainly nocturnal, they might be seen at dusk during the mating season from January to mid February. It is not unusual to hear the triple bark of the dog fox followed by the answering scream of the vixen. They nest in holes in the ground and in dense thickets. At night foxes forage over a wide area often becoming quite bold in winter time in their search for food. 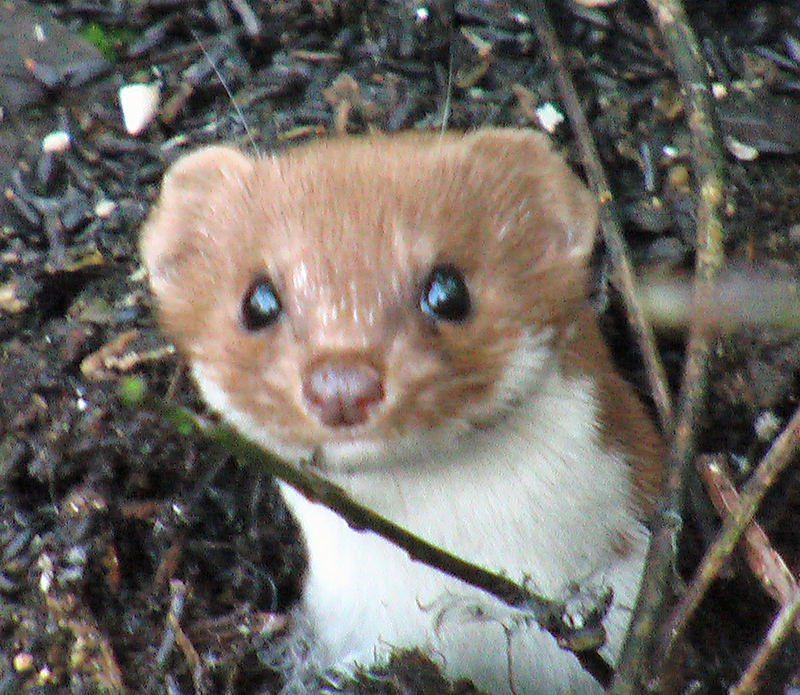 The weasel is Scotland's smallest carnivore - the male being slightly larger with a head + body length of 8 inches long and the smaller female being 6 inches in length. They have a smooth light brown coat and tail with white underparts and a long slender body with short legs. This sleekness enables them to follow their prey into their burrows. Their small size is well compensated for by their fierceness, speed and agility in hunting. They are often seen dashing across roads or sitting upright to gain a better field of vision for their favourite food of mice and field voles as well as small birds. This one recently appeared in our garden during the daylight as I was putting seed out for the birds. It suddenly emerged from a small hole in the earth about 2 feet away from me, gave me a good stare and then disappeared back down the hole. We have also seen it on the peanut feeder. It belongs to the same family as stoats, otters and ferrets. They are very similar to a pine marten, although much smaller. There are plenty of wood mice and field voles inhabiting the forest and fields nearby although they might not actually make an appearance. Despite their very small size they are an important link in the food chain for a wide variety of animals and birds including fox, stoat, badger, pine marten and various species of owls and birds of prey. Bats are also in the area and can often be seen flying round in the dusk.